Research in Motion confirmed reports this morning of a BlackBerry UK outage spanning across Europe, the Middle East and Africa -- a region often referred to as the EMEA. Shortly afterward, RIM announced it had resolved the issue but warned they were still performing a full technical analysis. BlackBerry Messenger and e-mail are somewhat analogous to Apple's iMessage and iCloud offerings. Blackberry smartphones rely on RIM's proprietary network and server infrastructure to securely transmit data to and from these services. Amidst such technical problems, one or both of these features may become unstable or even unavailable. RIM told its customers that for outgoing and incoming messages and emails, there may have been delays lasting up to 3 hours. The outage, RIM estimates, may have affected up to 6 percent of its total worldwide user base. The timing of this service interruption seems particularly embarrassing for RIM, perfectly coinciding with the launch of the latest iPhone -- a yearly event which seems destined to always become an incredible media spectacle. Of course, this isn't the first outage RIM's customers have endured. Coincidentally, a similar EMEA outage occurred last year just the day before the iPhone 4S hit shelves. An Apple conspiracy? 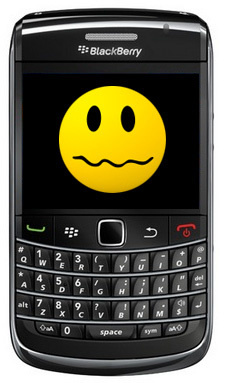 Probably not, but for every interruption, RIM can count on that many more unhappy BlackBerry owners. Incidentally, Yahoo announced plans to drop RIM from its list of officially endorsed smartphones, opting for Apple and Android devices instead. In terms of market share, RIM has continued to languish, but the company hopes to reinvigorate its iconic BlackBerry branding with fresh hardware and BB10 by 2013.